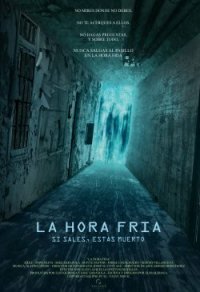 From Spain we have a great looking horror/post apocalyptic flick which translates to "The Cold Hour" (it looks like it's marketed in english as The Dark Hour). The movie tells the story of eight survivors of a nuclear war who live in an isolated, near ruined fallout facility. They cannot abandon the complex and they live in a constant state of vigilance. The food supplies are running out and they urgently need medicines and ammunitions, but in order to find them they must abandon the secure area. What lurks outside the small area they inhabit, however, is so menacing that they dare not even speak of it. Based on the website it looks like this in coming out the 14th of September in theatres, but it looks like that will be in Europe only. No word on a North American release. por dios que peli mas mala, aburrida, lenta, con unas actuaciones sin ninguna profundidad. Ni siquiera en el momento mas triste a la actriz se le cae ni una lagrima. Un guion de pena y un sinsentido total. La ambientaci&Atilde;&sup3;n para nada acorde con la historia ni el momento de tiempo que se supone que narra. La iluminaci&Atilde;&sup3;n sumamente homogenea solo se salva en ciertos momentos durante la hora fr&Atilde;&shy;a. El efecto de congelaci&Atilde;&sup3;n aunque poco currado es de lo mejorcito, junto con los invisibles. Pero que es eso, que se supone que vemos que pasa? todas estas dudas no tienen respuesta porque el gui&Atilde;&sup3;n es un intento de hacer un g&Atilde;&copy;nero en el que no se saben mover. Realmente p&Atilde;&copy;sima. Pens&Atilde;&copy; que peor que fr&Atilde;&iexcl;gil de Balaguer&Atilde;&sup3; no pod&Atilde;&shy;a ser pero me equivoqu&Atilde;&copy; Balaguer&Atilde;&sup3; es un genio al lado de esto. I think that "La Hora Fria" is perhaps one of the most interesting and valuable spanish films of this year. BTW, wonderful blog! Thanks! We aim to please.. now only if I Could get a screener.